I know that it is probably tough to get back into school mode, but I hope that you are making the transition. In today’s class, we started by first revisiting the hurdle rate for the Rio Disney theme park, separating those risks that we should be bringing into it from those that we should not. 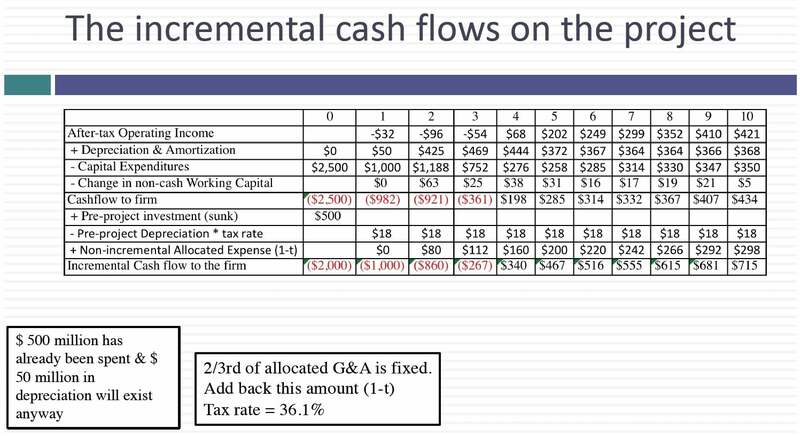 We then started the move from earnings to cash flows, by making three standard adjustments: add back depreciation & amortization (which leaves the tax benefit of the depreciation in the cash flows), subtract out cap ex and subtract out changes in working capital. Finally, we introduced the key test for incremental cash flows by asking two questions: (1) What will happen if you take the project and (2) What will happen if you do not? If the answer is the same to both questions, the item is not incremental. That is why “sunk” costs, i.e., money already spent, should not affect investment decision making. It is also the reason that we add back the portion of allocated G&A that is fixed and thus has nothing to do with this project. I have attached the post class test for today, with the solution. In the final part of the class, we looked at time weighting cash flows, why and how we do it. So let's go back to before the spring break. Feels like forever you've already forgotten betas and cost of equity encaustic of but hopefully not forever but we were talking about measuring returns right. And what I left you with is given a choice between earnings and cash flows go with the cash flows. I left with a parting thought to. Who would you rather be Winston Groom or Steven Spielberg. Winston Groom forgot to put his fate in the hands of accountants and paid for it. Steven Spielberg collects a portion of the gate receipts. And it's essentially paying for it in a different way. So ideally one more thing about cash flows and earnings to kind of bring this home every six months. I'm reminded how how little I trust accountants I've read books with three different actually four different publishers and they all screw me over. So I can tell the story about any of them but if you if I showed you the contract I have on my books it looks actually pretty good. I'm entitled to 15 percent of the net proceeds. On the books the accountant invent invented the word net should be tarred feathered and hung from a tree. How many of you have one of my books anybody anybody in this room. But nobody bought the book how much you pay for that book. Sixty five dollars for a stupid paperback. I remember the first time I wrote the book actually that is actually cheap it's a full prices are like a dollars. And in fact when I wrote that applied corporate finance book usually the publishers heads of them free copies that ran out of the copies I called the publisher and said Can I get ten more copies. And he said for you we'll give you a discount inside. OK. Just most beats you. I don't know what the price of the book was set size for twenty bucks. And she said to be eighteen hundred dollars. And I said what eighteen hundred dollars it's 20 percent off the list price and I said I don't want the I'm not paying 90 dollars for my own book. But ninety dollars is a lot of 15 percent. Ninety dollars is like 13 50 and even if you paid only 65 I should be making like 10 dollars off that book so every six months when I get my publishing statement here's what I do I take the check. The amount of the check and they also tell me how many books they sold over the six months I take the check the mind and divide by the number of books to see how close to 13 50 I'm getting. I have never made more than a dollar fifty a book there's many a slip between the gross and the net. I have no idea what happens between the time they sell my books and compute the 15 percent. But a lot of things seem to happen. I still remember one of the nine the third of the 40 or I look at my part. They send the statement with all these line items that I don't quite understand many of them are just numbers attached to them. Some accounting code. But my least favorite line item of all time is a line item that shows up in all of my nope so the publishers must have this collusive agreement where they have this line item that they've agreed to. And it says end of the year adjustment and Hofmeyer royalties disappear. What the heck happened at the end of each year so I called the publisher and they said I want to talk to somebody about this end of the year adjustment. So they put me in touch with the legal department. So you talk to a lawyer. Have you talked to a lawyer after 25 minutes you apologize for calling because you've no idea what you were talking about. I'm sorry I took up your time. I have no idea. So I called and he says look at Clause 7 7c of your contract. Pull it up. No idea what it says. It's written by lawyers for lawyers office. It does mention an end of the year and an adjustment but nothing other than that paragraph is even remotely comprehensible and I'm not. After about 30 minutes of frustration I hang up the phone and I decide to plug my pettier bench and I've been doing it for the last 15 years that petty revenge has been playing Ardin you might be the beneficiaries. Here's how I write my books I write them sequentially. I read Chapter 1 in Chapter 2 and as I write the chapter I create a PDF version of that chapter and I put it online. Why. Because I wanted to get feedback on typos and edits them. So from my valuation book which has 34 chapters I were Chapter 1 Chapter 2 Chapter 3 you get to Chapter 34 the tab book is done. It goes to the publisher. They printed it goes to the bookstore I forget to take the PDAF chapters. Off Like the first time it happened. My publisher calls me irate. I knew exactly what he was calling about but decided to act innocent. I said You seem upset. You said your entire book is online.